The Browser Wars taking control of “hosted” applications! “”As more and more applications become cloud based hosted solutions, the more urgent your choice of Internet Browser will become! The desktop warfare, in our opinion, is really getting out of control! You would think that you can use any browser for any website you want to surf, but such is not the case. We recently made the mistake of trying to pay our Microsoft Office Online invoice while using a Firefox browser. Only when we switched over to a Microsoft IE browser could we complete the transaction! In yet another painful situation while working with CISCO Prime Communications Deployment tools, we were experiencing a database access error. This error stalled development for several hours as we tried to find the root cause of the connectivity error. Only by accidentally switching to IE from Firefox, did we uncover that the connectivity error was a fraud perpetrated by our choice of browser. (Granted we think the only useful thing you can do with IE is download Firefox). Those of you who have been working with fat client based solutions, like Microsoft Outlook might actually be somewhat discouraged from using Microsoft Office 365. All of the usual operations like right clicking on an object to copy and paste are suddenly replaced with pre-historic multi key chord strokes like Control C or Control X. Personally, I find both Google and Microsoft cloud solutions to be frustrating! The simple act of high-lighting a range of text might cause you to go completely over the edge! The application will “bark” at you with an error recommendation as you try to replicate the desktop experience with your browser based application. We have many clients who require us to use a variety of different tools when we work on those projects. For example, some folks like Google mail rather than Outlook OWA as implemented in Microsoft Office 365. Web conferencing tools like Webex from CISCO and Lync or Skype for Business by Microsoft have very different results depending on your choice of browsers. Who is winning the war? Well is seems that Google Chrome is the hands down winner with a 44% market share largely resulting from losses by Firefox and Microsoft IE. 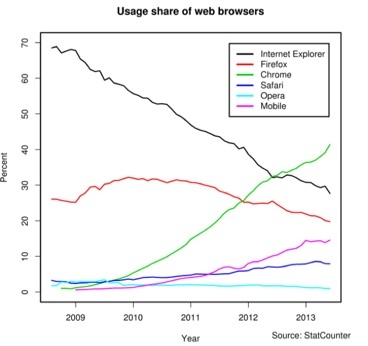 Apple’s Safari seems to remain relatively constant and newcomer Opera does not seem to be making an impact. These numbers hold true regardless of the platform, with Apple and Android showing the same browser preferences as their desktop competitors. So how do you survive with this level of warfare? We find that both Chrome and Firefox have outside developers who support the browser by creating add-ons. Our particular favorite is Firefox as they seem to have a wider community of developers. (We also figure anything you type into a Chrome browser is immediately searchable by the entire Internet population). Though feature comparisons are useless, and most folks just pick a browser based on personal preferences or device (Safari is an Apple product), we think Chrome and Firefox are the most open solutions. We are Mac freaks, but at the end of the day, WebRTC will most likely be developed by Chrome and Firefox who are not defending hardware market share or erecting proprietary application. The kool kids typically pick one of these two browsers if they are going to change from the browner that shipped on their Windows or Apple platform. As you use more and more cloud based applications you will become increasingly more aware of the browser warfare taking place on your desktop! At the end of the day, you are going to end up using more than one browser to get your work done! Hey watch how easy it is to get the password you left in your browser!